Runs again on the Gt2871. Just putting miles on it with baseboost and under 4500rpm. . Even there it feels quick. The new brakes are very impressive! The pedal feel as expected is a touch grabby. Might need to swap to a std 9-3 booster/master cyl. If only the 245s from my Aero would fit on this car. As soon as we get a 10.999 with the 2.0L Gt3071 that turbo will come back to the viggen and the new target will be made. 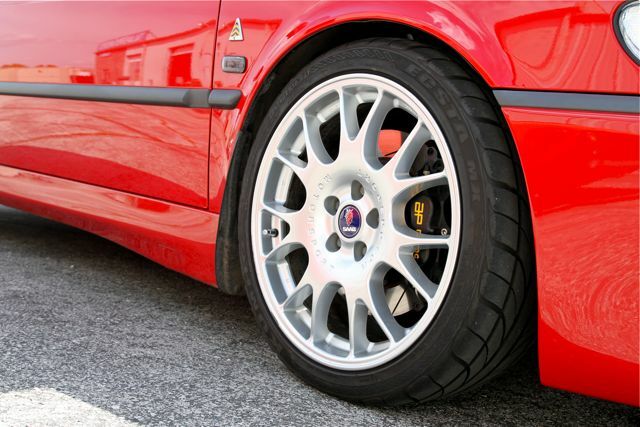 This entry was posted on Thursday, April 22nd, 2010 at 10.30 am and is filed under (Nicks) Viggen, Drag 2.0L NG900. You can follow any responses to this entry through the RSS 2.0 feed. You can leave a response, or trackback from your own site. Hi there, Very Nice cars you have here. I was just wondering what kind of rims are on your drag NG900?